This time of year we love a hearty dinner. Something warm and comforting after a day of full on rain or snow. 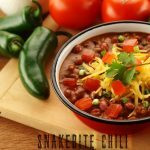 This Snake Bite Chili recipe is a perfect middle of the week dinner! But mind you, like my friend Lori says, “Chili isn’t a last minute meal”. It truly is an all day or 2 day deal. (its always better the second day as any Chili afficanado will tell you!) Cooking this in the crockpot insures you don’t have to ‘watch and stir’ or risk burning, but you can cook this in a large soup pot on the stove. For Christmas this year, I got a deep freezer. Complete with bow. I love it, its what I asked for and now keeping a freezer larder is even easier. This recipe makes a huge pot and unless you’re a family of 10 or more, you’ll have plenty to store back for another meal. It freezes beautifully! And its versatile. Make it mild or hot or somewhere in-between The choice is yours (no mixes or packets involved here!) Serve this bowl of deliciousness with a slice of cornbread or some crispy tortilla chips and you’ve got a hearty meal that your family will love! Grab a print and give this one a try! Let me know how you like YOUR chili! Homemade high protein and easy! 1 pound dried mixed beans pinto, red, black (use your favs) rinsed and picked over, and soaked. Add 6 cups water and 1/8 tsp baking soda to beans in large crock-pot. Cook on high 4 hours or until soft. Meanwhile brown ground beef in olive oil and drain well. To the meat now add onion, garlic, chili powder, cumin and oregano leaves. Add meat mixture to cooked beans (don't drain off the water from the beans). Stir in tomatoes and Rotel. Add Dried Chiles and stir well. Reduce heat on crock pot to low and allow to cook until beans are at desired softness and mixture has thickened slightly. Sprinkle on Cinnamon and stir well. Garnish with your favorite cheddar, sourcream, guacamole or crispy tortilla strips. If cooking for the family, optionally use Rotel mild and omit the chili peppers. **The baking soda is a neat trick I learned to take the 'gas' out of the beans. Makes them easy to digest. Sounds delicious!!!! 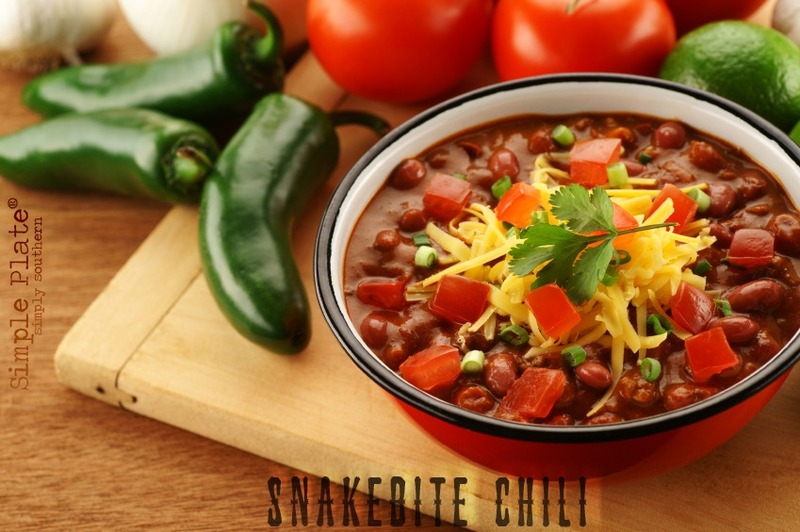 We haven’t had chili in a long while…think it might be time for some! We love chili at our house. You had me with beer in this one! LITTLE known secret, the beer calms some of the heat and adds a wonderful flavor. Of course the alcohol cooks off! I like a spicy chili with all the fix-in’s: cheese, cornbread, sour cream, onions, yum! I definitely will be trying that baking soda trick. :) I need to make some chili, and this sounds like something my family would love. I’m pretty sure any recipe that starts with “Snake Bite” is going to be right up my husband’s alley!! This looks so good. 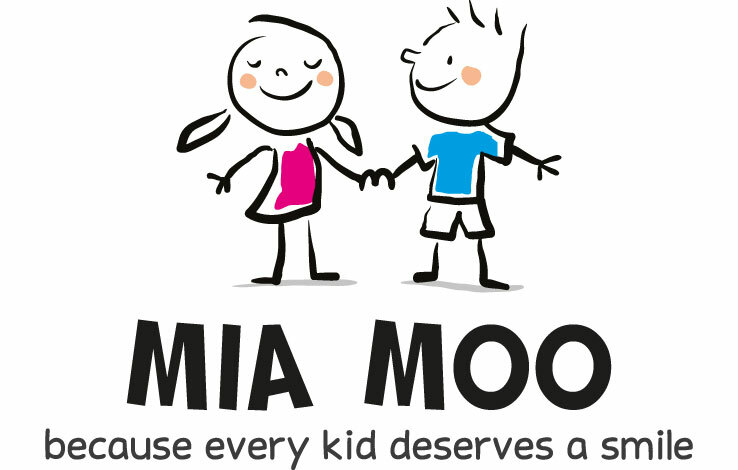 Love the name! Sounds like my kind of chili. I’ll be over in 10! Seriously. I want some like RIGHT now! Hop the next plane and bring cannoli! I totally agree that it’s better the second day. That looks fantastic! Ooh wee. I don’t know if my mouth would be able to handle this, but it does sound good! I love homemade chili. This looks fantastic. I had to show my Husband the picture! It looks so good! Thanks. Hubs is a big chili fan! My husband and son love chili….we are always looking for new recipes. thank you! I can not eat anything hot, but hubby loves this kind of stuff. I will have to share it with him. lol Cat. No snake, just snake bite! I’ve never heard of anyone putting cinnamon in their chili, that’s very interesting. My daughter has finally developed a taste for spicy food so we’re creating more recipes with bite! the cinnamon adds a unique flavor but not overpowering and of course without sugar its not sweet, but savory. Try it! Oh wow that looks delicious! My oldest LOVES chili! I love Chili. We have had really cold weather recently, so this sounds extra good! I keep the fixins in the house in the wintertime, nothing like a good bowl of chili to warm the body and the soul. it really really works. little bit of chemistry in the kitchen. it’ll make ‘bubbles’ as the beans cook, but won’t affect the taste at all! Chili is always a hit around here! Thanks for the yummy recipe! that looks good :) i’ll have to try it out sometime. my husband would definitely love it. This sounds great ! We love chili and I always make too much. I don’t know how to cook for less than 12. This chili freezes beautifully! First of all, gorgeous shot. Second, I am always trying to find “The” chili recipe so I am going to pin this! Thanks Trisha, I love this recipe myself, of course I’m a little partial, but its so versatile and you can control the heat and flavors! I use this basic recipe for everything from chili alone to those other recipes that call for ‘chili’ in some version like nachos, the infamous rotel dip with chili and more! enjoy! I’ve been collecting great chili recipes to give mine a run for the money. I love how simple this is, but it sounds like it will be delicious! Can’t wait to try it!